A 25-year-old male reported to our OPD with a chief complaint of swelling in the lower jaw since 1 year. 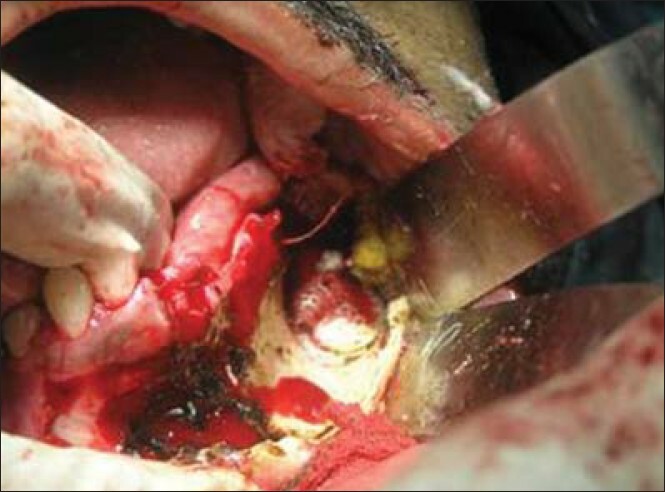 The patient had already undergone incisional biopsy at another maxillofacial center and on the diagnosis of odontogenic keratocyst had been advised mandibular resection and reconstruction using microvascular fibula graft. The biopsy was repeated and the diagnosis was confirmed. 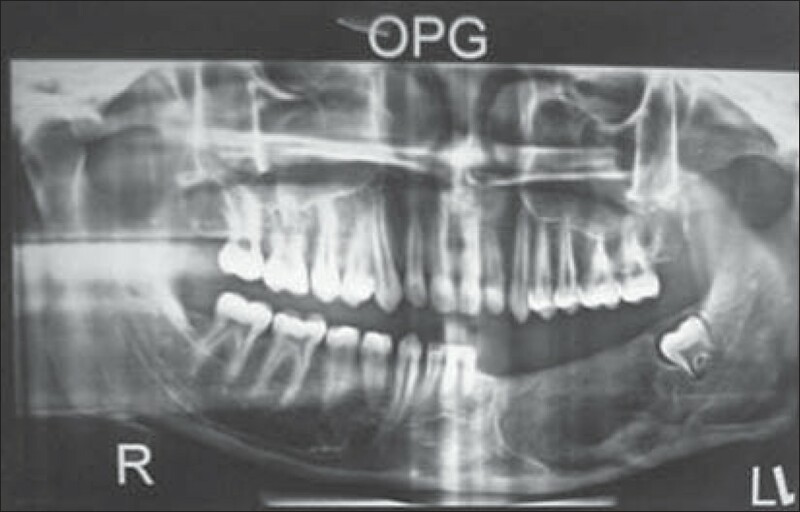 The radiograph (OPG) showed a multilocular cystic lesion extending from ramus of the mandible to the parasymphysis on the left side. Associated with the lesion was an impacted third molar displaced to the posterior border of ramus on the same side. The lesion appeared to have involved the inferior border of the mandible, making it impossible to save the same at this stage [Figure 1]. Taking the age of the patient and the associated morbidity of mandibular resection and microvascular fibular reconstruction into account, it was decided to adopt a novel approach that combined an age-old technique with one of the latest technical advances in dentistry. At the site where the biopsy was taken, i.e., left premolar region at the depth of the buccal sulcus, the bony window measuring approximately 5mm in diameter was left patent. Through this tube, an indigenously fabricated decompression tube fashioned out of a needle cap was inserted and fixed using stay sutures. The patient was instructed in self-irrigation of the cavity and oral hygiene maintenance. The patient was followed up monthly with sequential OPG investigation. The lesion showed radiographic evidence of decompression followed by decrease in size. Surprisingly, over the following 4 months there was also evidence of restoration of normal osteologic anatomy like inferior alveolar canal and inferior border of the mandible. At the end of 4 months, the patient was taken under general anesthesia and the cyst was enucleated through the transoral approach. Following enucleation, the residual bone was immediately treated with Carnoy's solution applied for 5 minutes [Figure 2]. The wound was irrigated and closed in layers. Postoperative recovery was uneventful and the patient was discharged from the ward. Monthly follow-up was resumed and the evident bone regeneration monitored. Over the next 6 months the bone showed no evidence of recurrence of the cyst. On the contrary it showed regeneration attaining almost premorbid alveolar height. At this stage, the patient was taken up for implant placement. Three endosseous implants were placed under local anesthesia. The implants showed satisfactory osseointegration and were exposed 2 months later for abutment placement. 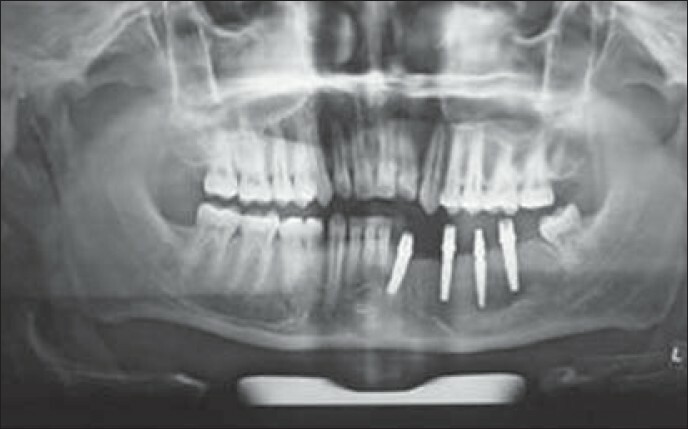 At this juncture, another, single unit, immediate loading implant was added to enhance the loading capacity [Figure 3]. The postoperative recovery after this surgery too was uneventful and the permanent prosthesis was duly placed. The patient was asked to follow-up every 6 months to rule out recurrence of cyst and failure of implants. A seven-year follow-up of the patient till date has proven no incidence of either. Odontogenic keratocyst continues to be an enigma for effective management. Several schools of thought have been proposed for its effective management but none has proven to be foolproof. , In managing such an entity, emphasis has to be laid on elimination of diseased tissue, prevention of recurrence, minimize morbidity, and restoration of function and aesthetics close to the normal. In an endeavor to achieve the above goals, we used a technique describe as Waldron's procedure where a large cyst was first decompressed to allow for cessation of its expansion followed by reduction in size. Once the size was reduced to acceptable levels, it was enucleated and the residual bone was treated with a tissue fixative, namely Carnoy's solution. The bone showed good regenerative potential after that and was allowed to attain the size and texture close to normal where after it was successfully used anchor endosseous implants that enabled effective prosthetic rehabilitation. ,[,4],, It is our opinion that this technique can be used in patients with large odontogenic keratocysts at either extremes of age where comorbidity of additional donor site, operative time, extraoral scar, and reliable bone available for implant placement are defining factors. 1. Barry CP, Kearns GJ. Case report-odontogenic keratocysts: Enucleation, bone grafting and implant placement: an early return to function. J Ir Dent Assoc 2003;49:83-8. 2. Jeffery C. Markt Implant prosthodontic rehabilitation of a patient with nevoid basal cell carcinoma syndrome: A clinical report. J Prosthetic Dent 2003;89:436-42. 3. Pitak-Arnnop P, Chaine A, Oprean N, Dhanuthai K, Bertrand JC, Bertolus C. Management of odontogenic keratocysts of the jaws: A ten-year experience with 120 consecutive lesions. J Craniomaxillofac Surg 2010;38:358-64. 4. Tolstunov L, Treasure T. Surgical treatment algorithm for odontogenic keratocyst: combined treatment of odontogenic keratocyst and mandibular defect with marsupialization, enucleation, iliac crest bone graft, and dental implants. J Oral Maxillofac Surg 2008;66:1025-36. 5. Thyne GM, Hunter KM. Primary reconstruction of the mandible with iliac bone and titanium implants following resection of a recurrent odontogenic keratocyst. N Z Dent J 1994;90:56-9. 6. Işler S, Demircan S, Can T, Cebi Z, Baca E. Immediate implants after enucleation of an odontogenic keratocyst: An early return to function. J Oral Implantol 2010. [in press0 ].